← The Big Project Revealed: Doing Real Work on Muni @ The SF Weekly! This morning was one of those mornings I woke up early, turned on the computer and suddenly got a zillion messages about today’s Sunset Tunnel disaster. My first impulse was to turn off the computer, and literally run out of town when these things happen, just because it’s so depressing. If ever you wonder why it is that folks literally celebrated that tunnel as a “God-send,” taking the shuttle downtown would remind you why. There are several reports that the reason the wires were collapsed was because someone decided to steal copper wiring, and thought that stealing it from you was a good idea. I’m still trying to verify this, but I’ve now heard it twice from 2 sources, and from the accounts of the damage, that would be about right. But I’ll still try and find out for sure. However, some happiness to brighten what looks to be a nice Friday, weather-wise. As you may or may not know, today is Foursquare Day, the first sort-of-holiday for a mobile app. What this means is many places are doing specials on drinks, food, etc. You can find a list of San Francisco events here, most notable are the ones at Pacific Catch in the Marina and in the Inner Sunset, who are attempting to get the “Swarm” badge for all who participate. There’s also one at the Ferry Buliding too. Also, don’t forget that tomorrow is Dogfest 2010! Whether you have a dog or just think dogs are awesome, this event, which is a benefit for McKinley Elementary School, is always a fun springtime event and proceeds go to a nice cause. Check it out! 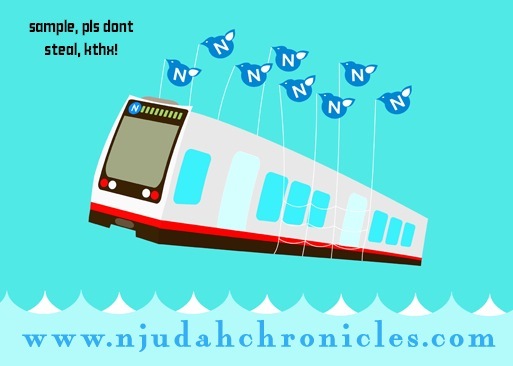 As always, why not celebrate the N’s fails with a FailWhale N Judah Shirt, or any one of our offerings. Be the best dressed person on the shuttle bus! This entry was posted in Duboce Park Dogs, N Judah News, News & Politics, Urban Life and Culture. Bookmark the permalink. A bit off topic, but does anyone know why the past two weeks nearly all the KLM rush hour inbound lines have been one car? It’s crazy, even at 9:40 cars are totally packed. what gives? Yes. Have a look at the Daily Rports on SFMTA’s site. Of the 115 needed for the advertised level of service 95-101 have been fit for service on mornings over most of the last month. Copper thieves? One of the lowest forms of (loosely defined) human life. The Yakima Interurban group in Washington is still trying to recover from a trolley wire theft several years ago. Of course sometimes justice prevails. A few years ago, some scumbag saw a vacant building in El Monte (about a dozen miles east of Los Angeles), and figured it would have wiring that he could steal, probably to feed a drug habit. What he learned out the hard way was that the building’s electric service was still energized, and 440 volts AC does not take prisoners. Let’s hear it for appropriate punishment. (for the record, I am a retired power co. employee and am actively involved with electric railway preservation). I posted the link below earlier (see your spam log). It’s to an Examiner article that confirmed the copper theft.